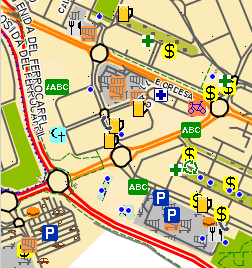 Is it possible to install several maps on the GPS at the same time? Are the maps compatible with my Garmin model? Can the maps be used in a GPS of another brand? What is the map scale? I have searched for something placed in an area I will travel soon, but device didn't find anything. Will it work when I'm there? What is the difference between map types (OSM base map, topographic, trucks and contour lines)? When I try to open the file I downloaded, Windows says image file is corrupted or it is not an image file. Yes, it is possible. How to do it depends on your GPS model. There are models which are able to read the maps only if the file containing them is called gmapsupp.img and models which can read the maps with other names. For the latter you just have to change the name to whatever you want, keeping *.img extension. For example. country1.img, country2.img, etc. The way to know if your device reads maps with a name other than gmapsupp.img is simple, just try changing the name and see if it recognizes it or not. For those which only admit maps called gmapsupp.img you have to do the following: download and install MapSource/BaseCamp version of the map you are interested in. Once done, from within MapSource or BaseCamp (using MapInstall utility) select the maps you want to have in your device and send them to you GPS in a single step. This way a unique gmapsupp.img file will be created with all selected countries. Note that maps installed this way are not connected to each other, so you'll not be able to calculate routes from one country to a contiguous one. Up to date, maps are compatible with all Garmin GPS models. No. Each manufacturer uses it's own map format and they are not compatible with each other. Unlike paper maps, these maps don't have a fixed scale. You can zoom in and out on your computer or on the GPS, so that scale varies. Current scale is usually displayed at some corner of your screen. If you search for something too far away (hundreds of km) from where device located satellites last time, it is normal it doesn't find anything. You have to simulate you are in a place nearer the place you are making your search. The way to do it varies among models. On some models, if you center map screen on the place you are interested in and then make a long touch on your device screen, an option to fix position in that place pops up. On other models it may be a Menu button option. OSM Base Map: Map for general use. It contains roads, streets, tracks, paths and POI among other elements. Most appropriate for nüvi series satnavs. Topographic map: It contains the same information than base map plus contour lines, which will give you information about terrain height and steepness. Suitable for outdoor activities, such as hicking, mountaineering, etc. Contour lines can be activated or deactivated as needed. Map for Trucks: Map specially designed to be used in trucks, as it considers weight, height, etc. restrictions affecting these vehicles when calculating routes. Elements without importance for these vehicles have been removed from the map, to make it clearer. Contour Lines: The only information in the map are contour lines. This map is necessary for topographic one to show contour lines on the computer and to be able to send topographic maps to device from MapSource or BaseCamp. It's a Windows problem. The file containing the map has .img extension and Windows thinks it is an image file, but it is not the case. It is a Garmin img format file. This file is not to be opened as other files in your computer, but to be copied to your GPS. Is there a map from ireland? habe mir schon mal nachdem ich meine Karte verloren hatte, mir mal ne kostenlose gmapsupp.img besorgt. Erhalte mit der aber immer die Meldung "keine Straßen in Zielnähe". Kommt das mit den Karten hier auch so vor? Ich spreche deutsche und automatisierte Übersetzung in nicht klar nicht. Ist Ihr Problem mit Karten von dieser Seite? Wenn so, überzeugen Sie sich, dass Sie die auf Einfall-Einrichtung aktivierte Karte ließen.